Lighthouse, Bay of Fundy, Nova Scotia. The days seem to be getting hotter and today was no exception - who would have thought the end of August would be hotter then the start? We packed up the camper, got it travel ready, then hit the road towards Yarmouth. The town of Yarmouth has a population of around 7,000 and is a major fishing and ferry port. One of the biggest attractions of the town is it's historic houses and buildings constructed at various times during the 1,800's by wealthy captains and business men. We did part of a walking tour through the town as recommended by the information centre, then watched as The Cat arrived and docked at the ferry terminal. The Cat is a massive catamaran which transports passengers between Maine in the US and Nova Scotia in Canada, hence Yarmouth is also referred to as the gateway to Nova Scotia. After checking out the town we headed for the Cape Forchu Lighthouse which stands guard at the at the mouth of the Yarmouth Harbour. Our aim today was to make it to the Digby Neck and Islands area, so we continued northeast along the coast from Yarmouth, a road also known as the Evangeline Trail. We passed through a number of historic Acadian towns, each with their own elaborately styled churches. Arriving in the town of Digby, we made various stops to photograph along the waterfront. The town of Digby and the Digby Neck and Islands region is located on the Bay of Fundy which is famous for having the most extreme tides in the world. Some parts of the Bay of Fundy have tides as high as 16 metres. When we arrived in the town of Digby the tide was low, and it's a long way down when you peer over the edge of the wharf to the boats below. Digby is also known for it's large fleet of scallop boats which harvest the famous Digby scallops - large, succulent fruits of the sea - yum!! From the town of Digby we started along the road which runs the length of the Digby Neck and Islands. We checked into the campground to secure our site at Whale Cove before continuing on towards the Petite Passage Ferry which would take us across the passage to Long Island. Since it was late in the day we just headed out for an evening cruise to the other end of the island where the road briefly terminates and becomes a ferry across the Grand Passage to Briar Island. We decided not to take the ferry so turned around at the end and headed back to Petite Passage. As we were crossing back to the Digby Neck, the sun was setting. 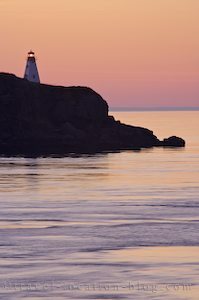 Once we reached the mainland of Digby Neck, we pulled off the road and looked back at Boar's Head Lighthouse on Long Island - it was a magnificent sight! We headed back to our campground and settled in for the night. Tomorrow we would explore the islands!